6-PERSON BENCH SEATING: Bring more passengers along for the ride. 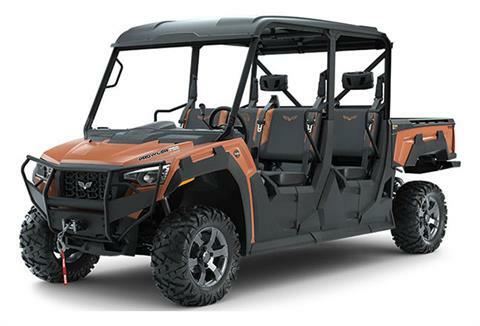 SUSPENSION & HANDLING: 10-inch front and 9.5-inch rear suspension travel, 10-inch ground clearance, 27-inch Maxxis Bighorn 2.0 Tires, selectable locking rear differential, electronically selectable 4WD. 3-Point Seat Belts, Seat Belt Rev Limiter, Half Doors, Roll-Formed ROPS, Headlights, Brake Lights, Passenger Grab Handles, Customizable Speed Controller.